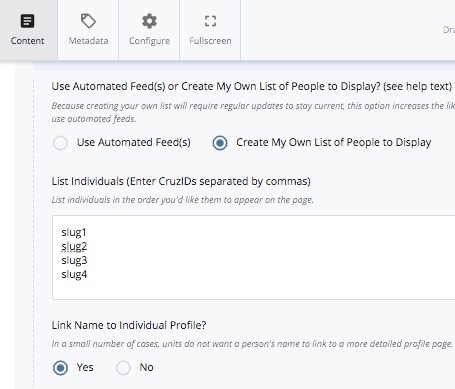 The Create My Own List of People to Display feature lets you specify the individuals to include on the page in the order YOU wish them to appear. NOTE: Do NOT include the "@ucsc.edu"
If a CruzID is not recognized (e.g. if it is entered incorrectly or the individual has left UCSC), it will not be included in the directory feed. If you need to add an individual, simply insert the CruzID where you would like the individual to appear in the list. To remove an individual from the list, simply highlight the specific CruzID (and comma that follows it) from the list and press Delete.